Business - When you need security and services to conduct business. The cPanel control panel’s graphical interface simplifies the management of your website. With cPanel, managing your domains, email accounts, and databases is quick and easy. Softaculous provides a simple to use graphical interface simplifying the installation of over 300 website tools. From WordPress to Joomla, setting up your site, databases, and scripts has never been easier. Website hosting that provides you what you need. Whether you’re using your site for information, sales, service or commerce, you want to know that your website will be up. You expect your site to be secure as well easy to manage. With a 99.9% up-time record for over a decade you can rest assured your web site will be all that and more. Right from our first interaction we strive to help. We will assist in registering a domain, transferring your website and provide management tools to ensure your security and continued performance. Our commitment to excellence does not end there. We are continuously searching for additional services to add to your package at no additional cost. As we find new services they are instantly added to your account. That's the advantage of cloud hosting - you don't need to reconfigure anything. It's simply there for you to use. WereDigital Hosting uses only exceptional products and state of the art serving and network equipment, but our biggest assist is our staff. They are always available to assist you. All of this is provided for one low annual cost. 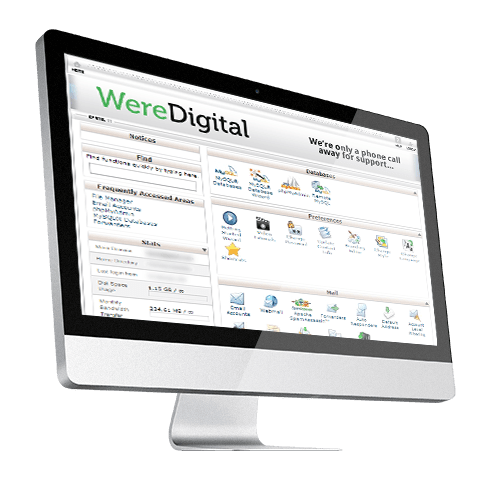 WereDigital always provides service before the sale and our staff is proud to have been working in the industry since 1995. Cloud hosting is simply the next step in the evolving world of the Internet and we are here to help you through. As the digital landscape is always changing and not all the tools you use are upgraded at one time we offer multiple versions of PhP in all account and on all servers. As always we will only provide tools that have available security patches offered by the developers. Our initial offering of multiple PhP has PhP 5.6 as the lowest version available and will be maintained until Sept 30 of 2017, we also have PhP 7.0 and PhP 7.1. Each version can be run on any domain in your account and is automatically configured. You can run multiple versions of PhP within each account as well but only one version per domain. 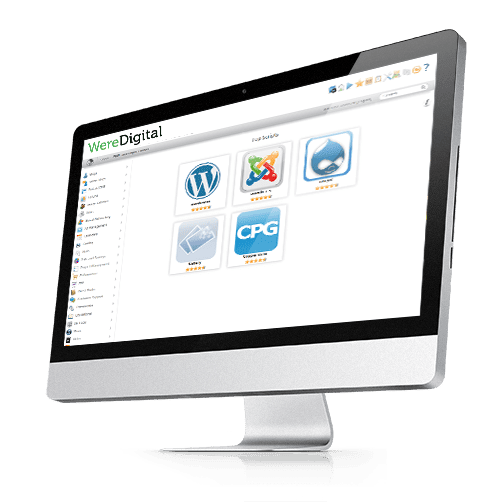 You have the ability to switch back and forth between version, thus allowing you to do testing of your website site before finally migrating to the next version. Find this feature in your cPanel interface in the Software section. When you’re investing time and energy into a website, you want to make it work whatever It takes. WereDigital helps you do just that. Our Hosting plans offer the tools and services you need to get your site up and manage it properly. Security is always the first priority; we monitor your site continuously. We include standard server-side spam filtering and email virus scanning with all accounts. Customizable email accounts let you extend your web presence into your corporate or personal image. Scriptalicious is included in all packages to help you get your website up and running quickly. Website Builders included in Scriptaculous offer a wide selection of Website templates so you can change the look and feel of your site quickly. Scriptalicious can install a complete selection of CMS (Content Management Solutions) Joomla, WordPress or Drupel to make editing your site easy.